"International calls can be used for free by staying at hotels affiliated with Samsung. Enormous amount of profits can also be earned by mining coins. Samsung Coins will be applied to every Samsung Electronics' home appliance. Up to $8.94 (10,000 KRW) will be pumped at New York Stock Market." "World's first comprehensive blockchain-based solution will be provided to marijuana users. This platform will provide best recommendations and guide users to right hospitals. It also provides tracking numbers to guarantee delivery of marijuana." 'Scam ICO (Initial Coin Offering)' is starting to target domestic and foreign users. Investors need to be careful since scam ICOs are gathering funds through absurd information. Crackdown of 'scam ICOs', which are spreading like poisonous mushrooms, is becoming very urgent. According to industries, ICOs such as SS Coin (Samsung Coin), Kakao Network Coin, Jesus Coin, Karma Coin, Budbo Coin (marijuana blockchain) that are similar to pyramid scheme are spreading like poisonous mushrooms. As of now, these projects cannot be seen as frauds as there are no legal and systemic guidelines on schemes involving cryptocurrency. However, after looking at white papers of these projects, many of them cover information that is completely not related to blockchain with future technology and spread false information while they are gathering investors. SS Coin (Samsung Coin) that misrepresents itself as Samsung Electronics is the prime example. Many incidences of scams were found through a cryptocurrency exchange called Bithumb. A reporter pretended to be a customer and joined an open KakaoTalk chatting room where Samsung Coin's ICO was taking place. 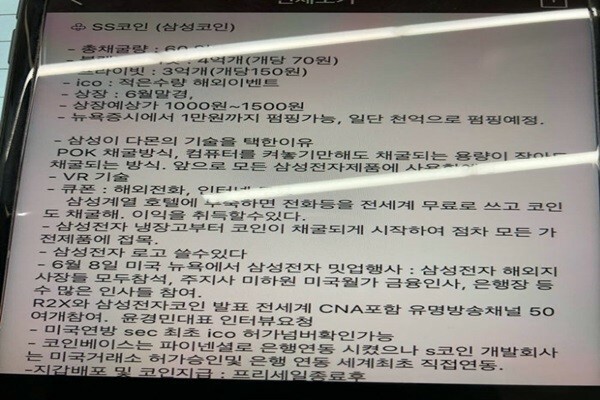 In this chatroom, the administrator showed information of Samsung Coin as well as written contracts from foreign presale corporates, foundations that issue Samsung Coins, and Samsung Coin's partners. Administrator of this chatroom estimated that Samsung Coin will be listed at New York Stock Market shortly and it will be valued between $0.89 and $1.34 (1,000 KRW and 1,500 KRW). Administrator even promised that Samsung Coin will pump up to $8.94 (10,000 KRW). Samsung Coin's future plans were even more absurd as Samsung Coin announced that coins will be mined just by leaving a computer on and that it will apply corresponding technologies to every Samsung Electronics' product. It is also possible to use Samsung Electronics' logo and Samsung Coin advertised that it received U.S. Securities and Exchange Commission's first ICO approval number. Usually, a chatroom on information about a coin is operated by paying between 0.03 and 0.1BTC. This reported requested more accurate information and written contract. However, this chatroom was not available anymore after this reporter tried to access it again. Bithumb figured out corresponding situation and it has currently prohibited withdrawal from accounts related to SS Coin according to its scam manual. It seems that there is significant number of victims as many investors have requested Bithumb to clear its ban on withdrawal. Number of reports where companies (TTC, BitClub, Airbit, Omnia), which promised to give extra pays through mining and trading, are not giving out extra pays is on rise recently. All of these companies are suspicious of their pyramid schemes. 'Kakao Network Coin (KON)' that plagiarize Kakao Bank's image and name and a coin that mediates marijuana, which is illegal in South Korea, have also appeared. 'Dokdo Coin' that leans on patriotism is also preparing for ICO. "Because it is difficult to secure evidence from scam ICOs and there are not accurate legal boundaries, prosecutors and others cannot resolve any request from investors." said a representative for a legal industry. "Because international organizations such as FSB (Financial Stability Board) and G20 are discussing whether to see digital currency as crypto-asset, it is difficult for us to set clear characteristics of cryptocurrency." said a representative for a financial authority. "We will try to enhance our monitoring to regulate illegal acts that occur during a process of gathering funds even if relevant laws that are tied to The National Assembly do not pass."